After yet another fierce, 45-minute gun battle, Majdi Abed Rabbo was ordered once again to negotiate his perilous way across the already badly-damaged roof of his house, through the jagged gap in the wall and slowly down the stairs towards the first-floor apartment in the rubble-strewn house next door. Not knowing if the men were dead or alive, he shouted for the second time that day: "I'm Majdi. Don't be afraid." All three men – with Kalashnikov AK-47 rifles, wearing camouflage and headbands bearing the insignia of the Izzedine el Qassam brigades – were still alive, though one was badly injured and persuaded Mr Abed Rabbo to tighten the improvised bandage round his right arm. The youngest – perhaps 21 – was taking cover behind fallen masonry from where he could see the Israeli troops who had sent the visitor. Nervously, Mr Abed Rabbo told them: "They sent me back so I can take your weapons. They told me you are dead." It was the youngest who replied defiantly: "Tell the officer, 'If you're a man come up here'." When the soldiers had arrived at about 10am, Mr Abed Rabbo, 40, had no inkling that over the next 24 hours he would make four heart-stopping trips, shuttling across increasingly dangerous terrain between the Israeli forces and the three besieged but determined Hamas militants who had become his unwelcome next-door neighbours. He would recall every detail of an episode which, in the telling, resembles the more melodramatic kind of war movie, but which was all too real for a man who by the end had lost his house and thought (wrongly) that his wife and children were dead. He had also witnessed at too close quarters the last stand of the men from the Qassam brigades in the face of relentless Israeli ground attacks and Apache helicopter fire. Reporting from Gaza City -- There were 14 of them huddled under the stairs. Israeli shells and airstrikes had long since shattered every window of the Helw family's three-story home. But underneath the concrete staircase, they said, they felt relatively safe -- until the soldiers came early in the morning on Jan. 4. There was pounding on the courtyard door, they recalled last week, and voices in accented Arabic shouted, "Who's in there?" "We all put our hands up and yelled, 'We're women and children. We're not the resistance,' " recalled Sherine Helw, Fuad's daughter-in-law. Khaled Abd-Rabou is sitting at the debris of his house in northern Gaza, looking across the border at the Israeli settlement of Kfar Aza. The bereaved father then turns his tears-filled eyes to a small doll of his 18-month daughter Amal, who was killed by Israeli soldiers during a recent deadly offensive. "They killed my children in cold blood," Abd-Rabou told IslamOnline.net. Amal and her eldest sister Souad, 7, were killed by Israeli soldiers during the first days of the Israeli ground operation last month. "Israeli tanks rolled near our home in the Jabaliya refugee camp," recalls Abd-Rabou. "They ordered us to leave the house." The panicked father took his wife and three daughters out. "As we walked a few steps from the house, an Israeli soldier opened fire from his tank," says Abd-Rabou, fighting back his tears. Two of his daughters died instantly. "Souad's body was riddled with more than 20 bullets and breathed her last in my arms," the heartbroken father remembered, failing to control his tears. "My youngest kid Amal bled to death." "Israel Wiped My Village off Map"
Gomaa Al-Bahabsa prepared himself for the worst on his way home knowing that the Israeli war machine had probably ruined the small place that sheltered him for most of his life. But nothing prepared the 80-year-old for the scale of destruction wrecked on his Guhr Al-Deek village. "There is nothing still standing, nothing," Bahabsa told IslamOnline.net, sitting on the pile of rubbles that was once his home. "Not the homes, mosque or the school. There is nothing left at all." The residents of the small farming village in southern Gaza Strip fled their homes during the Israeli air, sea and ground offensive, which killed some 1,400 people and wounded thousands. "The Israel artillery was directly targeting our houses with missiles, so we had to escape," recalls Abdullah Musleh, another villager. When the residents came back after the 22-day blitz was over to find absolutely nothing, not only of their homes, but of the entire village. "We left behind everything we had. We came back to find that it's all gone," lamented Musleh. "Two hundred homes in the village were crushed to the ground." Across the village, women and children sat weeping amid the ruins of their houses. Others sifted through the debris to gather anything left of their belongings. According to rights groups, some 200,000 Palestinians were forced to flee their homes in Gaza to escape the three-week Israeli onslaught. The Palestinian Central Bureau of Statistics says 4,100 homes have been totally destroyed and 17,000 others damaged in the Israeli bombing. Gaza's 1.5 million people are facing a food crisis as a result of the destruction of great areas of farmland during the Israeli invasion. According to the World Food Programme, the UN's Food and Agriculture Organisation and Palestinian officials, between 35% and 60% of the agriculture industry has been wrecked by the three-week Israeli attack, which followed two years of economic siege. Christine van Nieuwenhuyse, the World Food Programme's country director, said: "We are hearing that 60% of the land in the north - where the farming was most intensive - may not be exploitable again. It looks to me like a disaster. It is not just farmland, but poultry as well. "When we have given a food ration in Gaza, it was never a full ration but to complement the diet. Now it is going to be almost impossible for Gaza to produce the food it needs for the next six to eight months, assuming that the agriculture can be rehabilitated. We will give people a full ration." The FAO estimates that 13,000 families who depend directly on herding, farming and fishing have suffered significant damage. "Before the blockade and the attack," said Ahmad Sourani, director of the Agricultural Development Association of Gaza, which runs programmes with charities such as Britain's Christian Aid, "Gaza produced half of its own food. Now that has declined by 25%. In addition, a quarter of the population depends on agriculture for income. What we have seen in large areas of farmland is the destruction of all means of life. "We have seen a creeping process of farmers being forced out of the buffer zone around Gaza's border. Before 2000 we could approach and farm within 50m of the fence. After Israel's evacuation of the settlements in 2005, the Israeli army imposed a buffer of 300m. Although it is elastic, now there are areas, depending on the situation, where farmers cannot reach their farms in safety within an area of over a kilometre. It is indirect confiscation by fear. My fear is that, if it remains, it will become de facto. 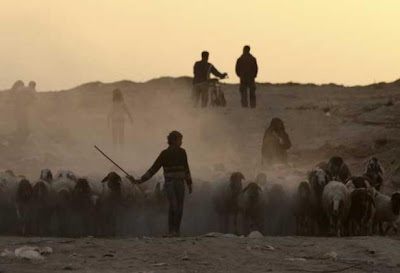 Bear in mind that 30% of Gaza's most productive land is within that buffer zone." The wholesale destruction of farms, greenhouses, dairy parlours, livestock, chicken coops and orchards has damaged food production, which was already hit by the blockade. Two weeks after an uneasy ceasefire ended Israel's 22-day offensive, Gaza is still struggling to come to terms with the cost of more than 1,300 Palestinian lives, more than 5,000 injuries and the total or partial destruction of some 20,000 homes. Last night Chris Gunness, chief spokesman for the UN Relief and Works agency, which has budgeted more than $300m (£205m) for an emergency food, health and repair package, said there was an "overwhelming" need for "industrial-scale building materials to be brought into Gaza to begin the task of rehabilitation, and that is before reconstruction in earnest even begins". The loss and devastation faced by Gazan civilians is as apparent in this rural village, a mere 1.5 kilometres from the Israeli border, as anywhere. Juhr al Dik is agricultural land, notably green by Gaza standards, but a month ago Israeli forces arrived here early in their ground offensive, establishing bases in some of the homes. Tank tracks are still visible where they swept west towards the sea, cutting the Gaza Strip in half. By the time the forces withdrew two weeks ago, and the residents returned from the temporary shelter in the nearby Bureij refugee camp, the forces had demolished 165 houses, displacing nearly half the 2,500 population, and razed olive groves, citrus orchards and sheep pastures, according to the local mayor, Salim Mohammed. Asked yesterday how he will set about reconstructing the shattered community here, Mr Mohammed said simply: "I have no idea." This was not the only shock visited on the residents of Juhr al Dik. At around 6.15am on 4 January, the first full day of the ground offensive, a shell landed at the house of the civilian Abu Hajaj family, the shrapnel injuring 12-year-old Manar. The Palestinian Red Crescent and the Red Cross said their ambulances could not get through because of the presence of the army. Badly scared, the family of 15 fled down the lane and took shelter in the basement occupied by their neighbour, Mohammed al-Safadi, about 250 metres to the east, and 10 other members of his family. The group included 17 children under 12. Mr al-Safadi, 59, a carpenter, said the Israeli military broke into radio broadcasts to announce those in border areas should leave their homes, holding white flags. His son Ahmed, 23, and Majda Abu Hajaj, 35, tied white scarves to sticks and led the group out. As they passed the their home, they saw tanks that opened fire on them. Mr al-Safadi was carrying his year-old son, Mohammed, and walking close to Majda's 65-year-old mother, Raya. He and Majda's brother both say Majda fell dead, apparently shot in the back, as the group ran back the way it had come and that Raya was also shot. Mr al-Safadi grabbed the wounded grandmother and they ran for the cover of the Abu Hajaj house. "She was saying, 'My hand, my hand' and then she lost her breath and died," he said.